Last Friday, I asked you to find two elegant finishes played by Richard Réti. Réti played 1 Be8 and Black resigned. There were few correct solutions to the puzzles, although Brian Wood did suggest 1 ... Bf5 in the first position, which also leads to a very big advantage for Black. To our way of thinking, this is the clear positional refutation of 2...e6, which, by the way, was first played by Capablanca (as Black) against Marshall and is based upon the simple circumstance that Black cannot find a method for the effective development of his Queen's Bishop. In the game referred to, Capablanca, in a wholly analogous position, played ...Ne4 and likewise obtained an advantage thereby. Of course, Reti's quieter development is also quite good. If the liberating move of 9...e5, recommended by Rubinstein and others, is really the best here then it furnishes the most striking proof that Black's entire arrangement of his game was faulty. For the simple continuation 10.cxd5 cxd5 11.dxe5 Nxe5 12.Nxe5 Bxe5 13.Bxe5 Rxe5 14.Nc4 Re8 15.Ne3 Be6 16.Qd4, would have given White a direct attack against the isolated Queen's pawn, without permitting the opponent any chances whatsoever. Moreover, the move selected by Bogoljubow leads eventually to a double exchange of Knights, without moving the principal disadvantage of his position. The proper strategy. After Black has weakened his position in the center, White forthwith must aim to change the closed game into an open one in order to make as much as possible out of that weakness. 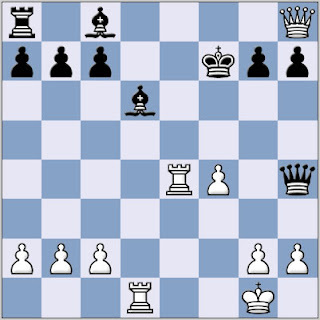 Not 13.exf3, because the e pawn must be utilized as a battering ram. Also after 13...Nxe5 14.dxe5 Bc5+ 15.Kg2 Bd7 (after the exchange of Queens, this Bishop could not get out at all) 16.e4, White would have retained a decisive advantage in position. Otherwise would follow 16.e5, to be followed by a break by means of d5 or g4. After the text move, however, Black appears to have surmounted the greater part of his early difficulty and it calls for exeptionally fine play on the part of White in order to make the hidden advantages of his position count so rapidly and convincingly. Attacking simultaneously both of Black's center pawns. After 18...Re5 19.Qc4+ Kh8 20.f6, among other lines, would be very strong. The initial move in an exactly calculated, decisive manouver, the end of which will worthily crown White's model play. If 20...Rd5 21.Qc4 Kh8 22.Bg4, with a pawn plus and a superior position. A sparkling conclusion! 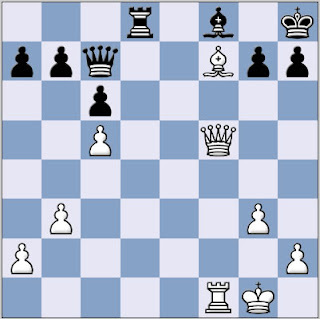 Black resigned, for, after 25...Bxc5+, he loses at least the Bishop.